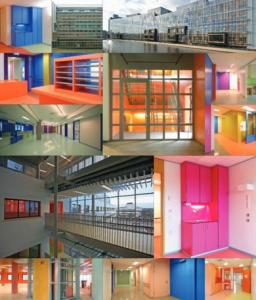 Hospitals are building on these insights by commissioning acknowledged artists specialising in colour early in the design process. One such example is the Van Swieten building within Martini Hospital in Groningen that saw the famous Dutch colour artist Peter Struycken joining forces with architect Arnold Burger and interior designer Bart Vos. By making colour an integral part of both the architectural design and structural concept, the three delivered against the brief that was to build a healing, non-clinical environment with the ability to change in time. Other guiding principles for the architecture of the hospital included access to daylight, views, and orientation. To create a flexible building with fewer fixed functions and a lot of access to daylight, Burger and Vos designed a modular-system called “Industrial, Flexible, and Demountable” – IFD with demountable modular walls and furniture. 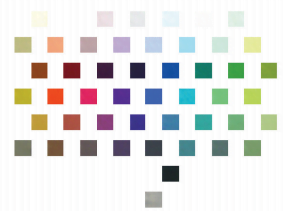 Struycken then composed a 47-colour palette from which Burger and Vos selected 19 including red, orange, yellow, green, blue, pink and purple. Molenaar further reports that “research has shown that patients and staff react positively to colour, and that they are less likely to feel like they are in a hospital.” Based on both official statements related to the project, and generally the research available on the subject, we can safely conclude that using colour in healthcare design elevates the spirit of all stakeholders. This article is grounded on the existing literature surrounding trends in healthcare architecture and design.